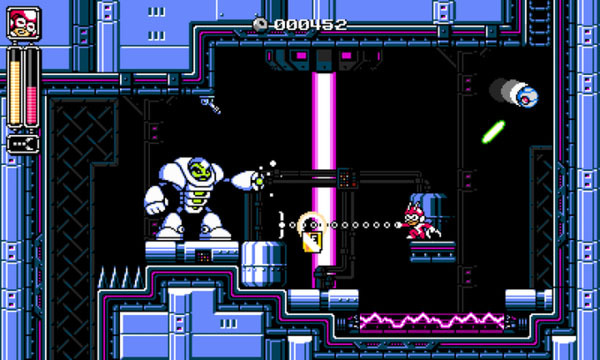 The Kickstarter campaign for Super Mighty Power Man, a Mega Man-inspired platformer for Nintendo Switch, 3DS and PC, has been cancelled – but it may turn out to be a good thing for everyone involved. As you may all have noticed by now we have been quiet for the past few days. One of the reasons for that is because we have been approached by several publishers. We are currently discussing with them alternatives on how to secure the development and the release of Super Mighty Power Man. Even though no contract has been signed yet, we are confident enough to say that the project will get funded and published at some point, which is a great news!" "In addition, another reason for our silence was the reception of our Kickstarter campaign. It is right to say that we haven’t succeeded in interesting enough people with our pledge tiers and late release date. Unlike many Kickstarter campaigns that overpromise and end up being late, we weren’t willing to follow a similar path. We are assured, based on the overall interest and tons of positive feedback we got from the press, backers and players that if we had gone crazy by announcing loads of physical rewards and an early release date on all platforms at once, our campaign would have probably succeeded. Nevertheless, it would also have been totally unrealistic to publicize such claims especially coming from an indie studio as small as ours. Therefore, we took the decision to cancel the campaign. We want to thank you, our beloved backers, for believing in us and our project right from the start." In the end, the campaign's failure may result in a better game – hopefully. I wish the team the best of luck! Publishers wanted them eh? Wonder if ol Capcom took up to offering them a job. "...we have been approached by several publishers..."
This is usually the first mistake. Next their game will be delayed over something dumb like online multiplayer, loot crates, extra DRM, etc. Before the game designers know what hit them, the publisher will be complaining about poor sales, taking control of the IP with no intention of making a sequel, and/or generating advertising which insults anime fans. I've seen any combination of these scenarios happen too many times. Box Hedge Games needs to be *very* careful. I seriously don't see anything that extreme happening to such a low profile, nigh-budgetless game. So what you're saying is one of the reasons it was cancelled was due to a lack of fan interest? rather because the fans of MMlike games are now warry of kickstarter. so even people interested have decided to not risk their money in it. i don't say that anyone is right or wrong about it, or that other project would have ended like Mighty n°9. simply, one big failure gave a bad publicity to kickstarter. That's why it's a good thing that publishers get interested in it. "cancelled due to a lack of fan interest"
I'm having a serious case of deja vu right now. I think this is something good, since by doing this they're taking away the biggest stigma the game had: asking money to be made. And, no, I'm not trying to be facetious. Bah..... It was going to happen one way or another... Games like these on kickstarter usually don't do so well. None of which being Capcom themselves! You know, after Mighty no. 9, I will never buy a mega man-like game before it's done. Never - and I believe there are more people who think like me. In all fairness if X Corrupted was gonna go on Kickstarter I would fund the heck out of it. In all fairness X Corrupted is a Mega Man game in all senses so it would fall out of DarkDreamTCK's terms. Also Capcom would be pissed. That or very indifferent cause you know it's not Street Fighter or something else they care about, either way they wouldn't let JKB get away with it. Is one mega man game too much to ask for? Me too. Annoying Capcom if you will. At least it looks like they might have some sort of future with a publisher, though. I hope they succeed. "One of the reasons for that is because we have been approached by several publishers. We are currently discussing with them alternatives on how to secure the development and the release of Super Mighty Power Man."